There is a certain retro-futurist edge to 172 Hours on the Moon, the first young adult novel by Johan Harstad, a buzzed-about and clearly space-obsessed Oslo-based author whose novel for adults, Buzz Aldrin, What Happened to You in All the Confusion?, has been translated into thirteen languages. 172 Hours on the Moon harks back to both the sunny sixties optimism of the first lunar landing and a dark-side-of-the-moon paranoia reminiscent of Kubrick and others. The novel opens with an international lottery that will send three ordinary teens to the moon, though readers know from page one that the “mission” is nothing more than a media stunt plotted by shadowy dudes in dark rooms who have been looking for an excuse since the seventies to resume some sinister unfinished lunar business. The three teens have less-than-scientific reasons to hitch a free trip into orbit: Mia, an aspiring Norwegian rock star who wears Italian paratrooper boots, just wants to get attention for her band, Rogue Squadron. (Her love for the “cold electronic eighties sound” of the Talking Heads lends the entire novel a David Byrne soundtrack.) Midori — from Harajuku, the capital of internationally mimicked Japanese schoolgirl fashion — sees the mission as a way to avoid “the Japanese trap” — marriage by twenty-five, followed by life as one of Japan’s “bitter wives.” (She later swipes Buzz Aldrin’s discarded moon boots as the ultimate Harajuku girl accessory). And Parisian Antoine decides that the moon is pretty much the farthest he can get from seeing his ex-girlfriend, Simone, with her new boyfriend. While the teens are busy with training camp, Mr. Himmelfarb, an elderly former custodian at NASA, now reduced to “a bag with eyes, a box no one really knew where to send” and stashed in a Miami nursing home, scrawls cryptic warnings regarding the true purpose of the mission in his mashed potatoes that — alas! — go unheeded. In the cold light of the moon, the teens discover a sci-fi surprise awaiting their arrival, and the novel speeds to its cinematic conclusion. Fans of Dexter, both the popular Showtime television series and the books by Jeff Lindsay upon which it was based, will find a similar flavor in I Hunt Killers, the ninth young adult novel from Barry Lyga. While Dexter asks readers to take on the perspective — and often, surprisingly, the sympathies — of a serial killer, Lyga tells his story from the point of view of a serial killer’s son. His mentor and nemesis is G. William Tanner — and yes, people actually include his first initial — “the local cop with a beer gut and a twang and one decent police car,” who brought down Jazz’s dad. Surprisingly, G. William has nothing but the most hopeful expectations for Jazz’s future as a moral, law-abiding young man; he does not, however, want the teenager anywhere near his crime scenes, no matter how keen his eye. Naturally, when a serial killer shows up in the town, Jazz is irresistibly compelled to pursue him. Lyga inserts some quirky touches: Howie, Jazz’s sidekick, is a hemophiliac; the father of his girlfriend, Connie, is less bothered by Jazz’s paternity than the unpleasant historical legacy of white guys like Jasper dating black women like his daughter. The author also provides plenty of imaginatively positioned corpses, forensic geekery, and the kind of psychological suspense one would expect from a handsome young teenager who is always afraid he will become a psycho killer. According to her bio, Leigh Bardugo, the author of Shadow and Bone, is also a Hollywood makeup artist (her portfolio tends towards artfully glamorous supernatural ghouls), Yale grad, and singer in the rock band Captain Automatic. 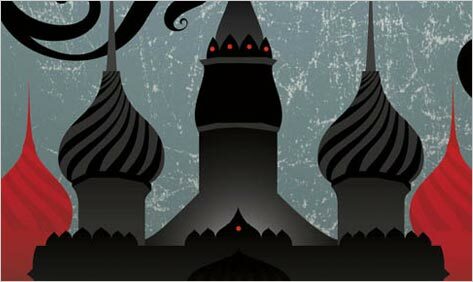 Her first novel is appropriately lush, gothic, and meticulously imagined, in a fantasy empire that owes inspiration to tsarist Russia. (Her author photo, in which she peers out, pale and icy blonde, from a furry black hood makes her resemble one of her own creations). Alina and Mal, two refugees of the border wars, grow up in an orphanage on a duke’s estate. Alina is “pale and sour, like a glass of milk that has turned” (though careful readers may suspect that one should never worry too much about the adolescent fate of heroines who, in childhood, lament that their main flaw is being too skinny and too tall). But when she and Mal are conscripted into the king’s army, she discovers in battle that she has special powers: the ability to harness sunlight into a weapon. Her gift, however, is also the thing that separates her from the only life and friendship she has known. While Mal continues as a lowly recruit, Alina is swept off to the palace, where she becomes a Grisha, or noble, and apprentice to the Darkling, a handsome, charismatic warrior whose duty is to train her to become a powerful warrior in her own right. With the help of Genya, a gorgeous redheaded palace girl who sometimes earns her keep by spending evenings with the king, Alina is transformed into a fetching young woman with “rosy cheeks and shiny hair and a…shape,” who wears gowns like “sewn-together shadows” and feasts with the other nobles on “roasted lynx, salted peaches and burnt swan with saffron” (coming soon, no doubt, to a foodie destination near you.) Her newfound beauty does not go unnoticed by the Darkling, though Genya warns her, from experience, to beware of powerful men. Many of Bardugo’s tropes — orphans with hidden talents, transformation — are familiar as archetype, but her meticulous attention to class, graceful prose and building a fully realized world makes this novel — the first in a series — an impressive contribution to the genre. Amy Benfer has worked as an editor and staff writer at Salon, Legal Affairs, and Paper magazine. Her reviews and features on books have appeared in Salon, The San Francisco Chronicle Book Review, The Believer, Kirkus Reviews, and The New York Times Book Review.